We apologise in advance for musicplaining this, but we have to make sure you know what we’re on about so… this week we’re talking about an artist called Hannah White who is working with a band called the Connections from Norway. Stick that in a blender and you get the sounds of Hannah White and the Nordic Connections. It makes more sense than Florence’s Machine at least. But about those sounds… Hannah is first and foremost a talented singer songwriter, and when she meshes with the Connections you’re looking at pastoral sounds influenced by the 70s, by Dolly, by a Carpenters who just got off a horse. Now, one of the videos we have for you today – for Start Again – doesn’t have sharp sound quality but we’ve included it because it captures a very intimate performance in a manor house in Bergen, and we are just dripping in jealousy for everyone who was there. There’s also the more outwardly country Please Don’t Take My Daddy Away, recorded live at The Yamaha Music Store, and a studio version of I See Sky with video. 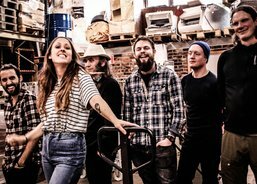 Hannah White and the Nordic Connections play this summer’s Black Deer Festival.